The WGC-Bridgestone Invitational will not feature on the European Tour next season after it was moved to the end of June by the PGA Tour of America. The PGA is bringing the event forward next year to avoid a clash with the Rio Olympics, where golf will feature for the first time since 1904. However, the June date clashes with the French Open at Le Golf National. As a result, money won at next year's Bridgestone will not count towards Ryder Cup points or the Race To Dubai. 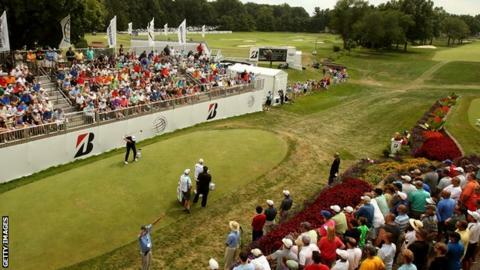 The Bridgestone event, this year co-sanctioned by the PGA and European Tour, was won last week by Irishman Shane Lowry. The French Open is continental Europe's oldest national championship, celebrating its 100th staging next year, and has been on the European Tour schedule since the Tour's formation in 1972. WGC events are open to all players in the world top 50, meaning many leading names will be playing at the Firestone Country Club in Arizona next June instead of Le Golf National, which is also the venue for the 2018 Ryder Cup. The European Tour requires members to play in 13 tournaments each year and with four majors and four WGC events counting towards that total.